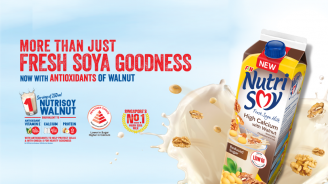 The new F&N NutriSoy Fresh Soya Milk High Calcium with Walnut in Singapore is an interesting product. This chilled soy milk builds upon soy milk as the foundation but with added walnut, a popular plant-based ingredient, which is often in stand-alone drink. 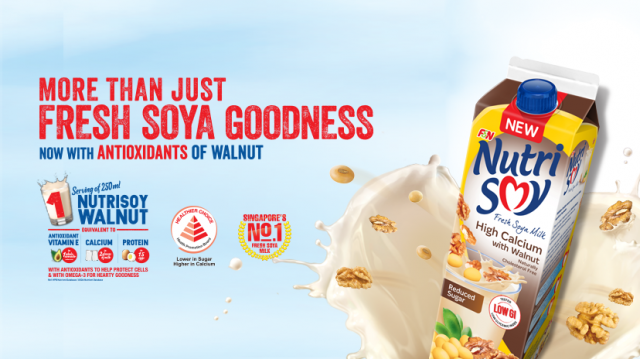 The new NutriSoy Walnut thus incorporates the best of the two most popular plant-based ingredients – soy and walnut. A single serving (250ml) of NutriSoy Walnut is equivalent to the antioxidant and vitamin E found in 1 whole avocado (medium-sized), calcium in 2 glasses of milk and protein in 1.5 eggs. NutriSoy Walnut is low in sugar and is tested as a low GI food. Also available in NutriSoy Almond.